"Opportunity is rare - Film is cheap!" This is the outdoor photographer's creed! Over the years I have had many hundreds of photos published in various magazines, newspaper columns, books and now on the internet. British Columbia provides infinite opportunities for scenic compositions and wildlife action. 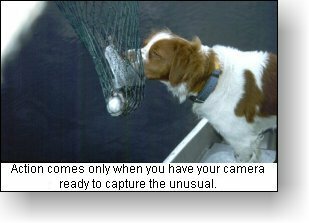 Many of my photos show successful anglers, hunting dogs and wildlife in action. 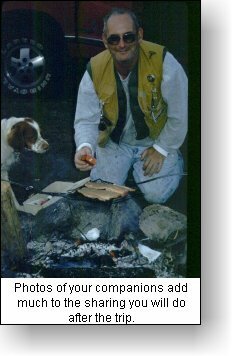 But, it was of interest to me when I recently examined themes in my published photos to find that many were of chance and opportunity. In those cases I was fortunate to be prepared with my camera and, in some cases, with two cameras, both loaded with film. One classic example was a chance opportunity I had with Killer Whales. I was returning to my launching site and spotted a large pod of Orca swimming past an island. I had film in both cameras and six spare spools. Suffice to say that as the sun set I found that I had shot eight rolls of 36 slides. It was a rare opportunity, a ocean meeting that has provided me with many superb photos of one of our most desired wildlife species. I must confess that the newer cameras with their 'auto this' and 'auto that' have contributed immensely to the outdoor photographer's creed. It is so easy to leave your finger on the shutter button and collect a whole series of photos of one subject. While this could be expensive it often adds an important facial expression, an action sequence or specific wildlife movement. "Opportunity is rare - Film is cheap" Always be prepared with those extra spools of film. I tape empty spool cases to my camera carrying straps, a useful tip for the outdoors and keep these filled with spools of film for immediate use when opportunities arise. My first major outdoor writing camera was a Pentax Spotmatic. It has been a solid workhorse and has traveled many miles. It is heavy for an active carrying camera and has taken a considerable beating, landing on sharp northern B.C. Rocky Mountain granite while I was pursuing Stone Sheep and Rocky Mountain Goats, and, falling in numerous British Columbia streams while I hunted steelhead . It has been a valuable tool to compliment my outdoor writing, so much so that I still have two in my travel cases with various support lens. 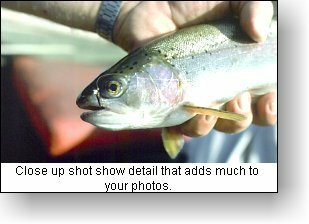 Recently, I purchased one of the newer 'auto' cameras, a Canon EOS Elan, and have been astounded at the increased photo variety it has provided, and, the increased number of quality pictures I have taken. My first film was black and white, ASA 400, the newspaper journalist film. It was a choice I will never regret for the high speed stop action in wildlife and sports action shots. In recent years, as I have branched into magazine writing, I have taken the advise of many other professional outdoor photographers and concentrated on the slide film necessary for magazine publications. Like many others, I now use Kodachrome 64 exclusively because of its consistency when developed. Taking photographs of your outdoor trip provides a vivid diary which you will treasure for years. I recommend the following tips to save time, money, and ensure compliments from your companions rather than apologies from you. Be close to your subject! Check the edges of the whole picture in the viewer to be certain that heads, feet, hands, etc., are not cut off. Be aware of the background so that you do not capture unwanted scenes or objects in the photo. Use your camera both vertically and horizontally. It is often astounding how a vertical photo provides pleasing lines for close up shots. Most 'auto' cameras have a high speed setting. If they do not, make certain to set your shutter speed beyond 200th of a second to stop blur. For photos of flying objects (birds, planes, kites, etc.) follow through with your shot much like you do when shooting a shotgun. 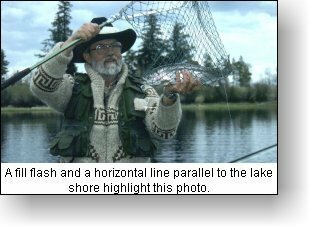 Be aware that parts of your main target will be distorted if they are at different distances from the camera. To add variety in your scenic shots take a series of photos starting at the left of the horizon and move towards the right. Use an object on the right during each successive photo to provide a point of reference. Prints tacked to a bulletin board give an amazing full horizon view. Use a familiar object in your photo to show relationships in size. Always keep the lower portion of your framed picture horizontal. Use a bush, tree bough, or diagonal line to add depth or three dimension to your photos. Make a point to instruct your partners how to use your camera. Have your partners take shots of you to complete the trip diary. To avoid future frustration, immediately throw out any 'out-of-focus' pictures even though they may be of an important scene. Be prepared for the unusual and unique picture. Have your camera ready at all times. For the outdoor photographer, action is the key and should always form the basis for the majority of your pictures. Good photographs, like everything else, are the result of care and planning. It is good planning that will show the total experience rather than just the action. Planning will not only compliment the visual diary but will complete the trip in all the detail needed for a nostalgic recall. Prior to the trip, a list of specific shots should be planned which will give a 'total' view of the trip. This list should include scenic shots of the location where the action took place. 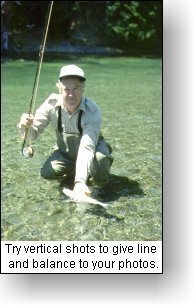 If fishing, a series of shots of the river, lake, or ocean which will immediately bring the total area to mind. If hunting, a series showing the mountains, valleys, and terrain where the trip and action occurred. If traveling or hiking show the terrain and locations: take advantage of signs for reference. Plan to find the vantage point from which the scene is most striking and typical for these shots and, do take the extra time needed to reach these destinations to ensure a complete trip photo diary. Your companions on your trip will make the most memories. Don't show 'mug' shots. Try for pictures that will show them doing the ordinary, the exciting, and the unusual. As well as the pictures which show the everyday routines, plan staged pictures to show unusual actions and activities relating to that particular trip. During the trip make a list of the things which are unique to that particular situation and stage these later when time and lighting permit.